Google has a long history of mobile-awareness. They’ve been investing heavily in their mobile technology and user experience for over a decade. Over the years, these pushes towards mobile have created famous headaches for car marketing professionals, particularly in the realms of SEO and advertising, but recently, the increased pace of mobile-first adoption and adaptation is leaving some dealerships behind. Google have been testing a mobile-first indexing system for over a year and a half, and the results are in: it is a mobile-first world, and it is time for mobile-first indexing. Google is now migrating sites to a mobile-first index. On March 26, 2018, Google announced that they’re officially rolling out mobile-first indexing. Let’s touch briefly upon some definitions, just to prevent potential confusion. Indexing is how Google’s algorithm gathers content. Google increasingly switching over to mobile-first indexing means they are shifting the way they evaluate pages. Mobile-first indexing is best explained when compared to desktop-first. “Crawling” refers to the process of reviewing and analyzing the content of a web page. Traditionally, desktop-first (on the right) indexing uses the desktop version of a site as the default basis for their page rank. Mobile sites don’t get crawled, but they do get a boost on mobile page rank if there is a corresponding mobile version for this desktop page. Mobile first, however, crawls the mobile site first and uses this as the default system for gathering information on the site. If there isn’t a mobile version of the site, Google will then crawl the desktop site and use the content it has found (and the fact that the page does not have a mobile site) to rank the page. 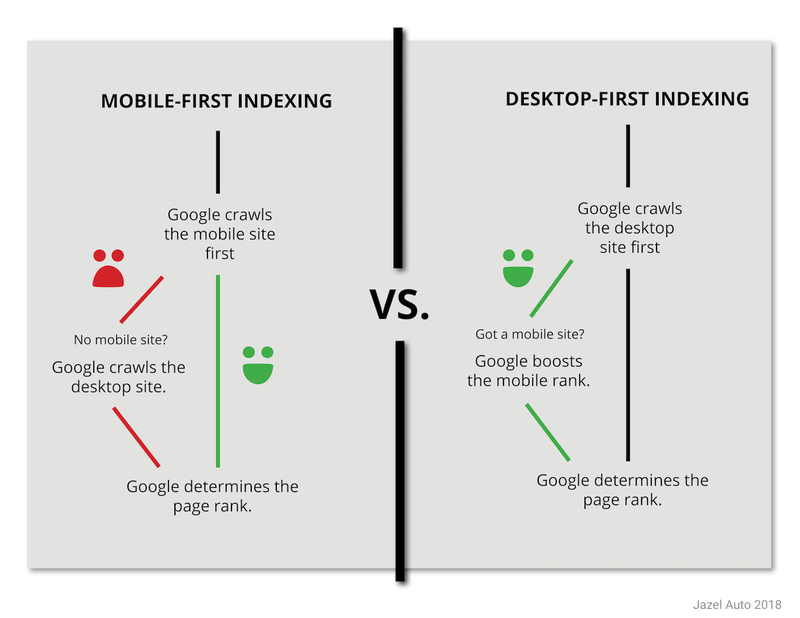 Despite the fact that our chart shows two different systems of indexing, Google doesn’t have a “separate mobile-first index” — they’re simply using a mobile-first indexing approach for more sites now, instead of the vast majority of sites being indexed desktop-first. It is also important to remember that this is about a content-gathering system, not changes to the ranking factors. While this shift doesn’t change how the algorithm determines page rank exactly, it does mean that the mobile-first shift has reached a critical point. How Can This Hurt Your Car Marketing? Most-obvious is the impact that mobile-first indexing will have on your page rank — even if it isn’t directly a change to ranking factors. The important thing to note with mobile-first indexing is that as your site is migrated to this system of indexing, your mobile site will be considered the primary site. For a long time, the desktop version of a site has been considered (and built) to be the main powerhouse of your online presence, while mobile is a mini-version of the desktop site with stripped-down features and less functionality. With mobile-first indexing, this less well-developed mini-site would be treated as the primary site. For sites that haven’t made mobile their absolute priority, it is reasonable to expect lower rankings, less traffic, and fewer resulting leads. SEO is cumulative. That’s why really great content shows up at the top of a page regardless of what updates Google implements. But it also means that losing the lead can mean it is tremendously hard to gain it back. For example, Let’s say your website ranked #1 for “Best Toyota Dealer in Dallas,” but mobile-indexing dropped your dealership to spot #5. Already that is not a great outcome, but it is now much easier for your mobile-first competitor to jump to the top spot. On top of that, the time your competitor spends in the top spot will mean their own SEO is growing stronger, and they’re gaining more traffic. Even if you do update to a mobile-first website, it isn’t guaranteed that you’ll be able to get back your former position quickly — or at all. The lesson here: do no delay in implementing mobile first. The early-adopters are already reaping the benefits, and it is time to make the change before getting left behind. One of the major ways that failing to adopt a mobile-first website can impact your car marketing is by ruining customer experience. Car marketing does somewhat adhere to the old axiom “a chain is only as good as its weakest link.” There are many elements to a successful car marketing campaign: SEO, social media, display advertising, reputation management, etc — and that’s just online. For example, if your advertisements are driving large amounts of mobile traffic, but the functionality or appearance of your mobile site fails to live up to your shopper’s expectations, your advertising has gone to waste – or worse yet, you’ve paid to turn potential customers off to your business! Mobile-first indexing isn’t the end of the world, but if your mobile site isn’t enough to impress Google, it certainly isn’t good enough for a huge number of potential shoppers. If this is something your dealership is worried about, now is the time to address this issue. According to Google, you’ll be informed of the switch via the Search Console. If you have been notified, you should immediately making sure that your site meets the best practices for mobile-first indexing and website design. Even if a site hasn’t migrated over yet, attempting to stave off the mobile-shift or evade mobile-first indexing is highly discouraged. Google isn’t implementing these changes on a whim, they’re doing so to reflect changes in user behavior and encourage users to stay of their platform. To do that, they have to give users the most relevant experience possible — and for most users, that experience is increasingly taking place on mobile. The only real way to effectively face the mobile-first challenge is to rise to the occasion and have a mobile-first site. Now, full-disclosure, we’re fans of mobile-first. We’ve written about mobile-first in the past. All our websites are created using mobile-first design. That being said, trust us, mobile-first is the best response to a mobile future (more like a mobile present, actually). Google is telling you the way the wind is blowing. If you want to create and execute successful car marketing, this isn’t a trend to fight, it’s one that dealerships need to bend to. AMP pages are an essential part of Google’s mobile-first push. Not only do they demonstrate a higher level of dedication to user experience than the average site, they’re optimized for Google’s delivery system. Normally, we don’t mention our product much, but it is particularly relevant, if only as an example of one of the best ways to but at Jazel, one of the ways we help our clients do their best car marketing is with our Rocket Pages. These are AMP-capable dealership website pages. These can display both VDPs and your Hours and Directions pages — two of the most important sources of information for shoppers, and leads for your dealership. A few years ago, Google’s big mobile update was called Mobilegeddon. After the wailing and gnashing of teeth subsided, however, the world moved on — and websites moved with it, onto mobile devices. These changes, as intimidating as they can be, are simply the tides of the future. Dealerships have no choice but to follow them (surfing, if possible), or burn out trying to swim against the current. 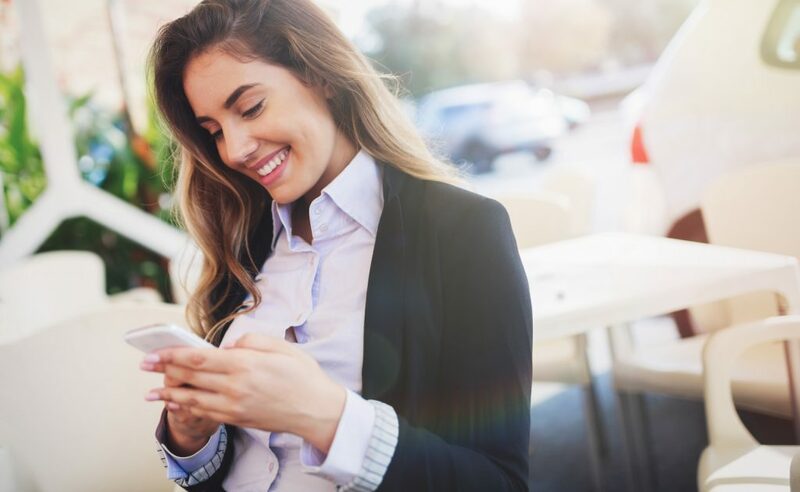 For car marketing professionals looking to future-proof their dealership, a mobile-first strategy across the board must now take top priority.